End Game Rankings: BRRRRT Stock Exchange Results! Congrats to whoever played under the name Jaden Yocom! There were quite a few lead changes, but he won out in the end there. Kinja, y u make photos blurry! Click to view them clearer. 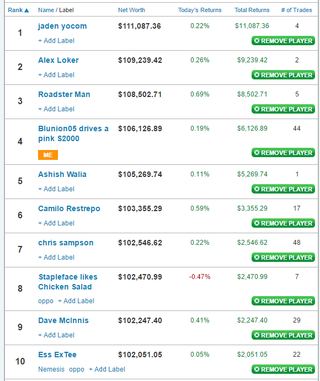 And at the bottom, we have Deekster, congrats on losing almost $20,000! Travis had the most trades, at 106, almost 50 trades more than the next most active trader.